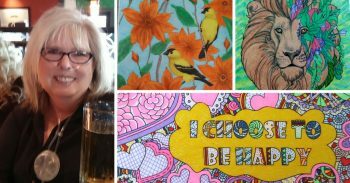 Dear colorists, today’s Artist Spotlight features Kathleen AbdelMassih! She is a very talented colorist and a fan of grayscale designs. 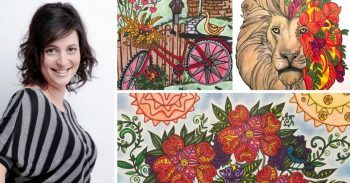 We love her artworks and her attitude to coloring. It helps her distress and focus on creating beauty. 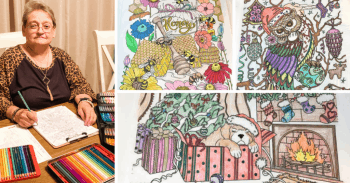 Kathleen also supports beginners and suggests that more people should try coloring instead of being constantly in a hurry or locked in their electronic devices. 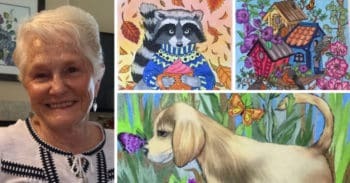 Read this interview and support Kathleen by leaving your COMMENTS under THIS POST and by SHARING her amazing story on Social Media. 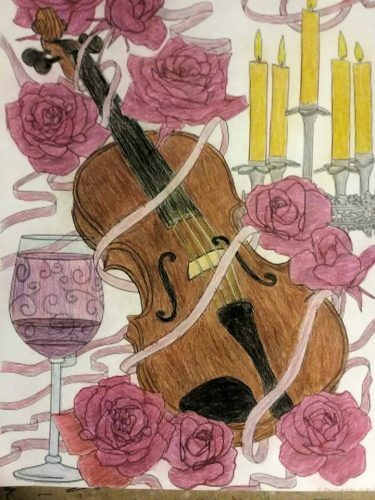 I began coloring about 3 years ago. I did it to help me to relax. Coloring helps me slow down my thoughts and concentrate. 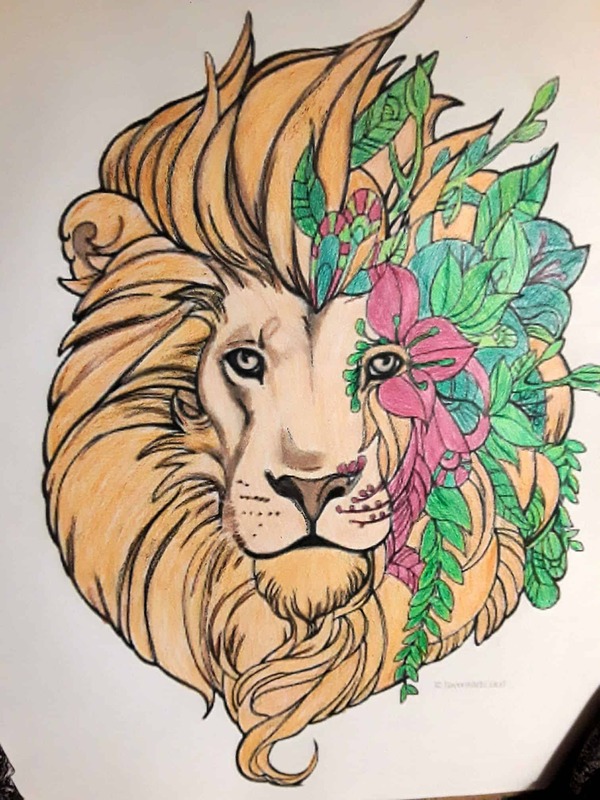 I have some health issues and am unable to take medication so coloring helps me keep my focus on creating beauty rather than focusing on my pain. I have taken a liking to grayscale. Grayscale pictures challenge my creative side as far as portraying depth and dimension. I am inspired by many things when I color. First, my picture choice is made going through the pages I have to color. I look at each one and as I do, colors come to mind usually for a particular picture. That is the one I will color. As for choosing colors, much of that depends on the picture itself but mainly I choose colors based on my moods. Coloring for me is generally my way to keep distressed so as a rule, I prefer to color alone. However, there are occasions where a friend will join me in my creative endeavors. My perfect coloring atmosphere is me sitting in my double recliner with my coloring supplies next to me. I have a clipboard in my lap with my current work in progress being worked on by me. Sometimes I have the TV playing but the sound is low as I sit, immersing myself in my work of art. 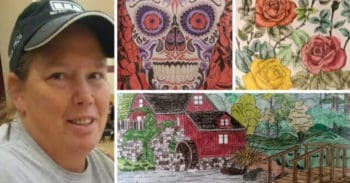 I believe more people should try coloring as it can be very relaxing as well as fun. Too many people are in such a hurry or so locked into their electronic devices that they are on edge all the time. If more people stopped to breathe and relax by being creative, I think the world would be a much calmer place to live. I am not an artist but I am a colorist. I have found that in coloring I can express myself so much better than with words in many instances. Coloring will add color, beauty, and peace of mind to their lives. 7. You mentioned that you love grayscale coloring. Could you give some tips for the beginners? Coloring greyscale can seem a bit intimidating at first. My advice to those who may be a bit timid in trying it is to find a simple greyscale design, and just use darker shades in dark areas and lighten up. The more experimentation as far as shading and highlighting different areas come with time and different pictures. Watch videos, interact with other colorist and artists. Don’t be afraid to just go for it. 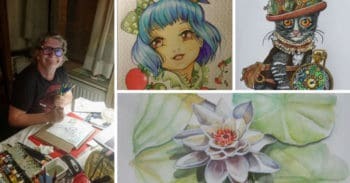 In the beginning, I was very nervous about greyscale but now I get many compliments on my work especially the greyscale which are now my favorite pictures to color. 8. What are your go-to coloring tools? My go-to for greyscale are my Colorit pencils and my Prismacolor pencils. Start out doing simple designs and work your way to more detailed designs. Don’t be afraid to try coloring different artists’ pictures. Never doubt yourself and your work. Don’t worry about how many people like it as long as you like it. 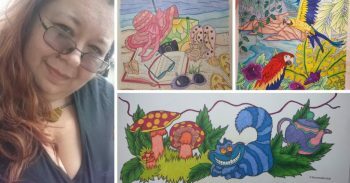 I have been privileged to be in quite a few coloring groups on Facebook and through these groups I discovered Favoreads. I was a bit nervous because I saw such beautiful work. I hesitated for a second thinking my work doesn’t measure up. Then I remembered beauty is in the eye of the beholder. I quit doubting my work and jumped right on in and began coloring to the best of my ability. I really enjoy the 3d greyscale. They are so beautifully drawn and truly inviting to the eye. I can look at them and see the colors I will use very quickly. 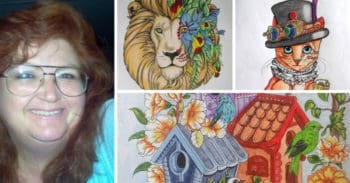 Brilliant Artworks by Kathleen AbdelMassih! 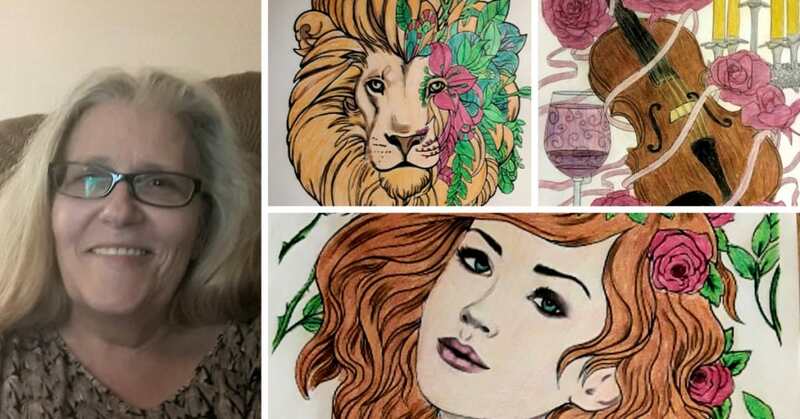 Check out these gorgeous colorings by Kathleen. Let’s appreciate her talent and support her. 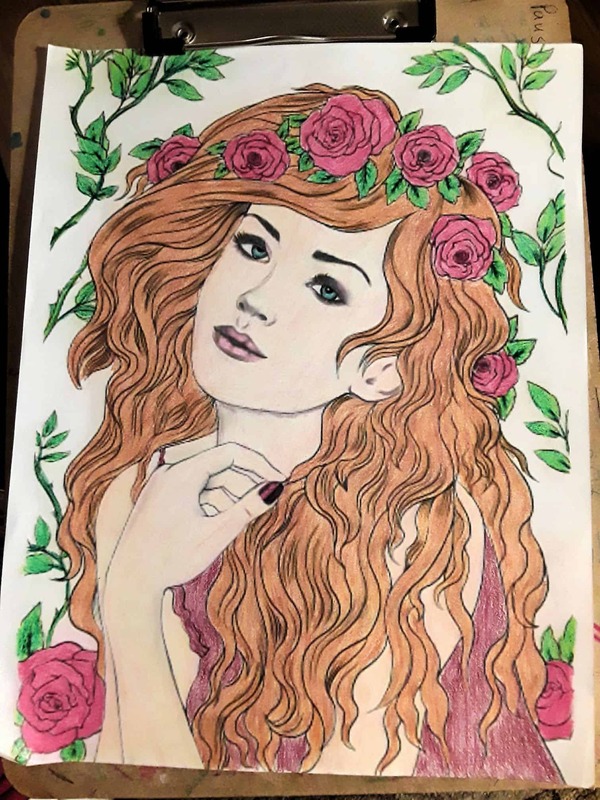 LIKE & SHARE her colorings on FACEBOOK or give her on OUR WEBSITE!